P.O.L. CREAM is formulated to deliver the proven benefits of phospholipids – powerful natural antioxidants and the chief moisturizing agent in the skin which cover the skin to provide long acting moisturizing and protection – to treat and heal skin irritation and inflammation from chafing and burning. Phospholipids are the prime building blocks of all life forms – phospholipids are indispensable to all forms of life and healthy skin: assembling and strengthening skin cell membranes, stimulating microcirculation and accelerating the natural healing of superficial and serious traumatized skin. 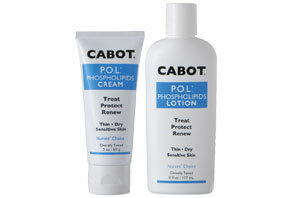 The super-moisturizing formula of P.O.L. CREAM soothes the minor burning and itching that can occur when skin is healing. P.O.L. CREAM provides quick relief following radiation therapy, cryogenic (freezing) treatment, laser treatment, and many other dermatological procedures. P.O.L. CREAM helps prevent and soothe irritation and chafing from prosthetic devices, running, and other friction-induced problems. P.O.L. CREAM is very effective for runner’s rash on the thighs, armpits, groin or any place where skin-on-skin friction causes chafing. And unlike many anti-chafing products, P.O.L. CREAM contains no petroleum ingredients. P.O.L. CREAM also delivers two other natural lipids, glycolipids and ceramides and contains the antioxidant vitamins A and E to protect and promote skin repair. Healing and soothing allantoin helps maintain skin health. Hyaluronis acid attracts and retains moisture, while dimethicone and glycerin protect, condition and hydrate skin. P.O.L. CREAM is steroid free and antihistamine free, so you can use it as often as needed. Can be used without a prescription or a doctor’s order. Non-greasy formula will not stain clothing or bedding. Recent studies suggest that regular/daily use of P.O.L.® CREAM, which incorporates Cooplerlabs’ proprietary, patent-pending complex of phospholipids, glycolipids, and ceramides rebuilds skin tissue and may prevent or even reverse many problems associated with thin, dry, aging skin.